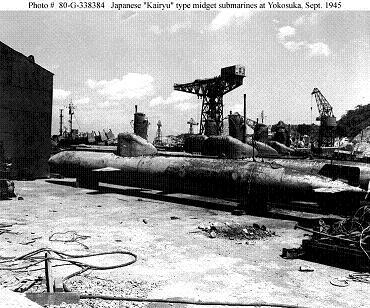 56'11" by 4'3" by 4'3"
The Kairyus were originally designed as midget submarines with torpedo tubes. Because of the lack of torpedoes, and because their mission was near-suicidal at best, most were equipped as suicide craft with a 600 kilogram charge instead of torpedoes. 760 were ordered but only 213 had been delivered by the time of the surrender, and none of these carried out a combat mission.